A serial port interface at 3.3 volt is available on the CM3-Home to connect external microcontrollers like Arduino or ESP8266. The signals are available on screw terminals as visible below and are at 3.3 volt level. The lines are not-tolerant to 5 volt. This port is visible in Linux as /dev/ttyUSB3 device. As an example of a serial communication, a working example of data exchange with an Arduino board is supplied in the SD card. The LEDs color and position and the servo angle can be set with the ready to use interfaces. The ambient light level is shown with a knob used as instrument. Control and Arduino board through the serial port. Let’s see the Arduino code. The serial port, configured accordingly to the Arduino board used, keeps waiting for data. When they are available, the program starts decoding them as a sequence of comma delimited BCD values. The string ends when a carriage return character is received. 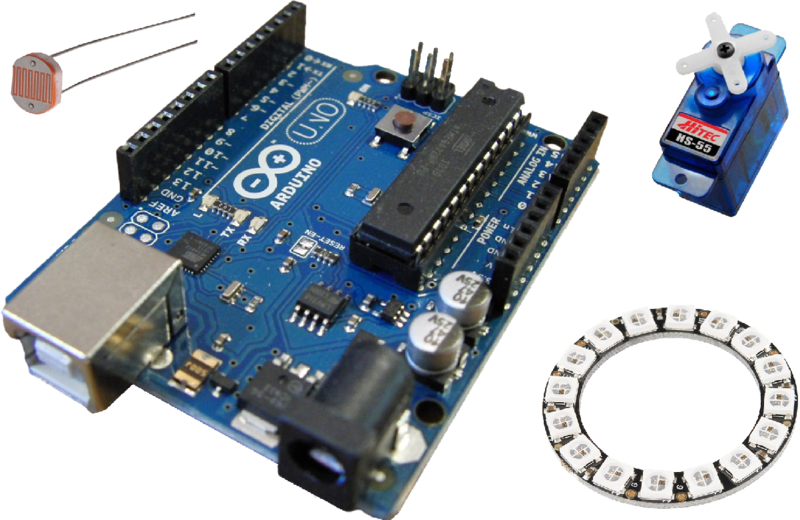 The ‘Arduino’ item is used to receive the ambient light data string from the external board. The ‘LedRingPos’ is used to send the number of LEDs in the ring to switch on. 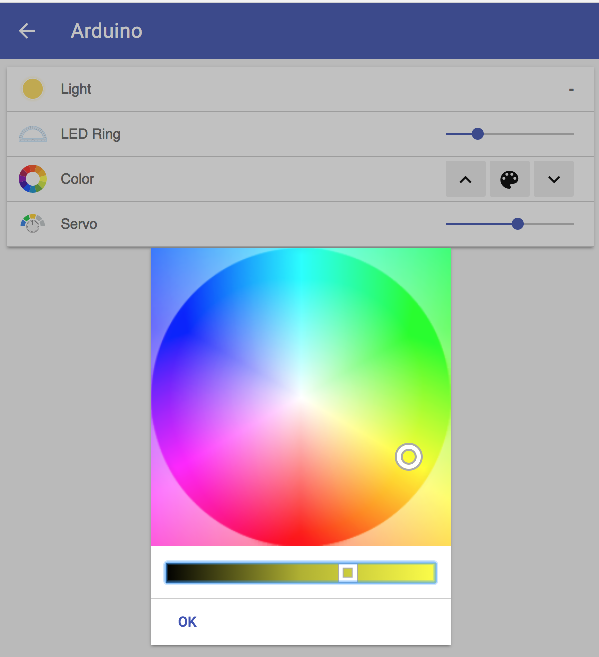 The ‘LedRingColor’ item is a Color type, specific to manage HSB color values. The ‘Servo1’ item is a dimmer type to setup the servo position. The ‘toSerialTTL’ item is not visualized, it’s used to send the string to Arduino through the serial port. To prepare the data from and to the external board, we have to use some rules. When the colorwheel values change, the LedRingColor item status acquires the HSB variable values. 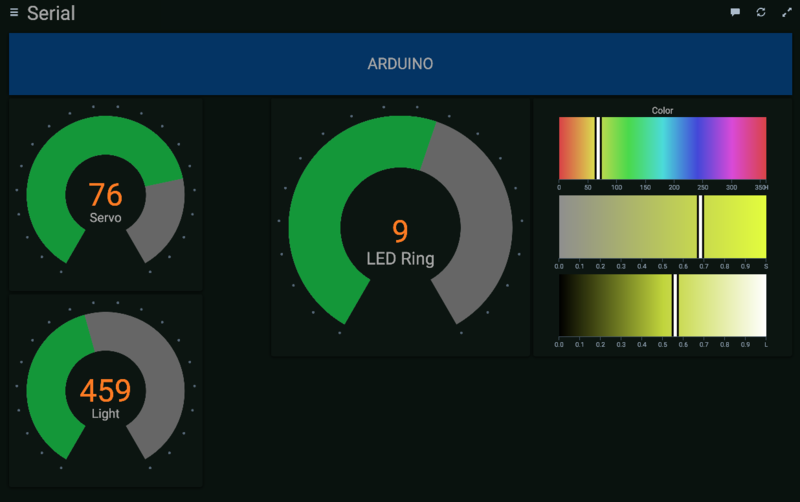 Because the LED ring needs the 0 to 255 RGB values, we must use the red, green, blue (from 0 to 100) methods multiplied by 255. They must then formatted as a BCD comma delimited string and sent to the serial port. To setup the number of lighted LEDs a dimmer item is used. It generates a 0 to 100 value. Dividing it by 6.25 we have a 0 to 16 value. Similarly the Servo1 dimmer status is multiplied by 1.8 in order to have a 0 to 180 range. The value received by the Arduino, i.e. the ambient light, must be converted in a numeric variable to be used. The item status must therefore be converted as a string before to have a BCD value, this can be then converted as an integer. Being a numeric variable it can be used in a rule to, for example, switch on one of the aforementioned KMTronic relays when the value of ambient light falls below an established threshold. To use those items they must be defined in our sitemap file.